The thing that I love most about design is the immeasurable impact it has on people and the decisions that they make, without them even knowing it. We live in a visual world with amazing art and design all around us. When I get a project and start designing, I strive to create something that makes people stop and look. I want people to remember what it is that I've created. Problem solving is something that I have always been drawn to and design has proven to be the most difficult, but satisfying, problem to solve yet. Every project that I have the opportunity to be a part of brings forth new challenges and things that I have not yet seen or considered. I approach projects with equal consideration in function and aesthetic, because in the end I am not just an artist; I am a communicator, a problem solver, and design is my language. I like to sip suds as much as the next guy, so when I was approached by a bar owner who was looking for a logo and label design for his in house beer I was excited. The main thing this bar owner wanted to accomplish was to create something that would appeal to the people who spent the most time at his bar, ages 21-35. I aimed to capture millennials lifestyle with a cohesive aesthetic. When approaching this logo design, I really wanted to create something with a modern and sleek feel. Focusing on the clients request to make it appeal to younger drinkers, I made a point to make Tote different from beers like Pabst and Budweiser with their old school approach to typography and color blocking. In order to find inspiration, I spent time at the owner's bar to get a first hand feel for his consumers, as well as researching alcohol companies that lined up with the demographic I was working with, such as Ciroc and a local Utah beer, Uinta Brewing. The common thing that was both companies were clearly doing successfully were clean typography and bold iconography. With that in mind, I focused on conveying what "tote" literally means. Tote is the German translation for "dead", which the owner derived from a German play he had once seen called "Die Tote Stadt." I wanted to avoid creating a logo that was too dark for the everyday customer. Through my sketches I played around with forms of a skull by using the shape of a hop, a bottle, and a mug. I liked the way that the bottom of a beer mug contoured like a skull. The final mark uses a mug shaped skull while crossed barley plays at the idea of a skull and cross bones. 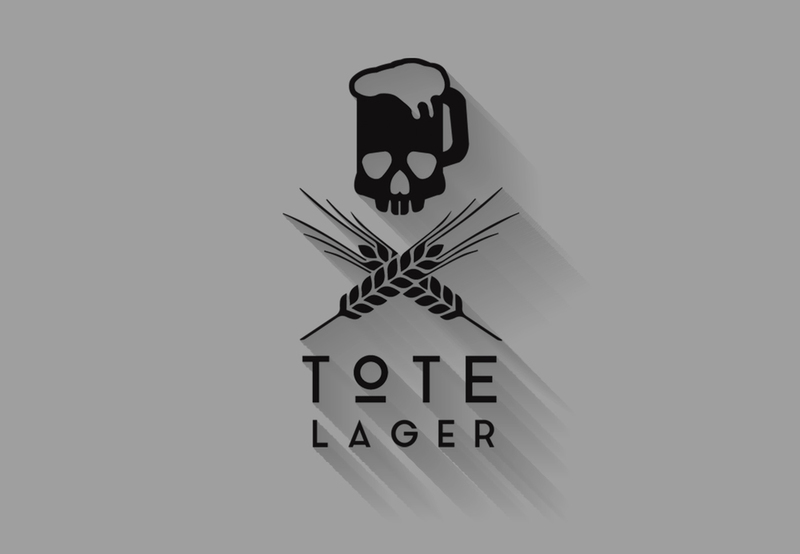 "Tote Lager" is spelled out in a clean San Serif with a lot of kerning to air it out and let it breathe. For the beer labels, a subtle geometric pattern adorns each label on a bold color that relates to each beers namesake. "Morgenluft", meaning "morning air" in German, is dressed in green to reference nature. "Sommerliebe", meaning "summer love", is put together in bright oranges like a summers day. "Mood Mag" publication, based on what moves people, gave me the chance to design three pages for a digital article about one of my biggest hobbies, sneakers. Discussing what it truly means to be a sneakerhead, the article touches on the explosion of sneaker collecting and what goes on in the world of shoes. Using my knowledge as a sneaker collector, I set out to design an article that would properly portray sneakerheads. I decided to quite literally create a sneakerhead for the cover of the article by drawing my own profile and then overlaying all of my favorite sneakers to create the front illustration. This being a digital publication, flat designs were used to show off smooth lines and bright colors of the shoes. In the background a subtle grayscale cityscape was used to reference where sneaker collecting is most popular in big cities, like Chicago and New York. I illustrated each sneaker bold and flat so they would each appear crisp and clean on the digital magazine screen. The final product is an interactive article that sheds light on the sneaker collecting world. Using flat, bold illustrations I kept the article bright and easy to read. The last page features a slide of four shoes with the largest cultural impact, each placed above a description box styled like a Nike label. After researching for each team's uniforms, I redesigned each to focus on their respective nation's culture and the history of their soccer team. The World Cup gives players the honor of playing for their families, friends and most importantly their country. With each uniform I wanted to create something that not only honored each team's country, but was also a representation of each team's play on the pitch while paying close attention to details. As one of the most decorated soccer teams in the world, Germany is known for their size and attacking style of play. Black and Deep Red blend to tell the story of Germany's intense style of play. The black upper on the body of these uniforms are meant to make the German players look more broad and intimidating. Four Gold lines run across the chest as homage to not only the German national colors, but also their four World Cup titles. The abdomen is fit with a deep red and accented by a subtle, but oversized, German crest. Keeping with the intimidation of black, the lower half of the uniforms speak to German intensity on the pitch. For Ghana, a green and black fade theme speaks to the rain forests that cover most of the country, while also accenting the athletes body. An ashanti pattern adorns the shirt, paying homage to the largest tribe in Ghana and their rich history. Ghana's National Football logo gives a bit of national pride to the chest of the uniform. A combination of blue tones, made from brush strokes, adorn the shirt in order to encapsulate France's rich history as the art center of Europe, while also referencing the speed that the French team is known for playing. The shorts are white with accenting side stripes that feature the French National Team's nickname, "Les Bleus". Rounding out the uniforms, are a bold finish that cites Frances tri-color flag, red socks. Small touches of national pride are placed through out the jersey, from the French crest on the front of the uniform and socks, to a small tri-color flag placed inside the collar. A small new restaurant Brass, sought me out for the branding of their restaurant and bar. Brass is a reference to the owners roots in New Orleans and love of Bourbon Street jazz music. Based in a trendy spot where there are lots of little shops and restaurants, I knew that the demographic for this restaurant would be younger. Getting to know what the vibe was around that area, I wanted to create a logo that would feel warm and receptive. Taking inspiration from old art posters from New Orleans, as well as the art of Saul Bass, I started sketching out different variations of logo using Bourbon Street's favorite instrument, the trumpet. Playing with combinations of a trumpet spelling out the word Brass and also illustrating that it's a restaurant, I landed on a trumpet with silverware as the keys. Keeping the texture on the primary word-mark and logo references jazz music's unpredictable nature. Another part of the Brass project was designing an app that could be used to check the menus of the bar and restaurant as well as make a reservation and order. The app uses black and white New Orleans themed pictures in the background with white text set a top. Hand drawn icons represent the four options while sticking with the overall theme of the brand..
A year ago when the thought of the Rams moving back to Los Angeles was just pie in the sky, I decided I would rebrand a potential move. Being in Los Angeles for more than 50 years, the Rams have a remarkable visual history in Southern California. My goal was to return the team to greatness and make a clean break from the current logo form and uniforms. When I started the process of rebranding the Rams, I went through images of when they were at their best in Los Angeles. Using those old images of the Rams and the rich history and enduring character they have in LA, I reintroduced deep royal blue and yellow that define LA and its iconic bright lights. For the logo, I printed out pictures of Rams so that I could better understand the shapes that would lend themselves to make a successful mark. Sketching out a number of different marks, I decided the current logo had a good shape but just need a few adjustments to be more successful. For the primary mark, I redrew the Rams motif to better represent the competitive spirit that is a proud and determined come back to LA. Cleaning up the sharp edges and getting rid of the cartoonish details of the current Rams logo, I focused on making the shape of the ram's head more round and modern. Following the recent trend in professional sports of abandoning heavily illustrated logos, I simplified the face while maintaining the intensity of a professional football team. The new uniforms feature a refreshed color scheme honoring the Rams past and present. The base uniform is charged with a deep royal blue and paired with a bright yellow used on the shoulders and pants. Inspired by varsity lettering, new numbers with modern styling are placed on the front and back of the uniform with a yellow trim. The shoulders feature the iconic rams horn that accents the broad space of the shoulder pads. Matte blue helmets feature the rams unequaled horn helmet decal in a chrome yellow finish that shines as the players move on the field. Fice is Salt Lake's go to spot for sneakers and streetwear. The sneaker/art culture has been growing like a weed for the last five years in SLC, and Fice has been right at the fore front. Fice is a store that is not afraid to push the envelope in a city that is known to be conservative. Fice specializes in community, being the only sneaker shop in Salt Lake who not only let's customers camp out for limited releases, but also gives them pizza. The frequent art shows they host give local artist a chance to display edgy and new work that would otherwise be pushed aside in Utah. Fice is truly unique, so when I was first approached by the owner to design apparel for them I couldn't think of a place I'd rather lend my design expertise to. Giving me almost complete creative control, Fice laid out only a couple things they were in to: space, the Illuminati, vintage and anything and everything Salt Lake. A homegrown store, Fice blends Salt Lake with a growing street wear culture. Talking to the owner about which brands are most successful at his store, I studied graphic trends in the streetwear companies that I like to wear and that Fice sells. From companies like 10DEEP and Rebel8, hand drawn typographical elements and bold clean graphics are huge right now. Knowing what the Fice owners liked for subject matter I set out to create a diverse set of graphics that would sell well. Standing forty feet tall, El Mac and Retnas painting of Mary on the side of Fice's shop is the most recognizable piece of street art in downtown Salt Lake. With that as my inspiration, I wanted to create a bold illustration of Mary that would represent Fice's famous painting. Illustrating the Mary I wanted to create a shape that would fit well on both the chest and the back. I ended up creating this pill shaped Mary graphic that fits perfect on the back in between the shoulders as well as a small chest hit. For those who shop at Fice there is a sense of community. Focusing on that community and Fices love of space, I created the "Star Fleet Academy Patch" design. Based off of NASA's astronaut patches, this graphic wears like a badge for those who consider themselves part of the "Star Fleet Academy" (one of Fice's many nicknames). Mission Salt City sits on the opposite side as a direct reference to the 801. Sticking with the space theme, this graphic was a throw back to old space illustrations of the fifties with their heavy black lines and pen stroke texture. Placing the planet on the large of the back allows for the graphic to be large and easily read. Trying to emulate that 50's comic feel a retro rocket ship shoots out of the word Fice. The last graphic was designed with magic show posters of the 1800's in mind. Using filigree and a ornate cursive font Fice is placed on a large chest graphic. Voyager was a new innovative take on low cost local air traveler that was brought to me for a new brand identity. Starting with research, I spent hours looking at uses of current airline logos. One thing that is clear in the current landscape of airlines is red and blue dominates. Another trend in recent years, as with many large corporations, is moving away from marks that have a lot of depth. Using what I learned while researching other airlines, I wanted to create a logo that would read well on every usage. During the sketching process I worked to create a logo that accentuated the "V", while also creating movement. Once I landed on the final mark, I went through a number of different color usages to create something that was soothing and representative of air travel. The final mark uses a signature "V" that plays on the tail of an airplane while creating a "V" that moves through a circle. Navy and Teal make up the colors of the logo as reference to the sky as it changes from light to dark as you ascend in an airplane. A custom San Serif font is used with a split color block to continue the sky color treatment. In the end the clients dream of getting this small airline off the ground never came to be and the business plan was scrapped, but it still remains one my favorite designs. Starting in February, Society6 got together with In4mation, a lifestyle brand based out of Hawaii known for their distinctive "HI" logo. Opening up collaboration, Society6 asked artists from around the world to submit art to be featured on limited edition hats. In edition to the hats featuring the "HI", I was asked to design two limited edition hats that featured a new S6 monogram, as well as represented Society6, and would appeal to the diverse demographic that purchases from us. When starting to design the hats, a new monogram was needed that would better fit the front of the hat than the current Society6 logo. I sketched a number of different monograms from Serif to San Serif and different interlocking styles. To create the sunset pattern, I used watercolors and a mixture of pinks and yellows and greens to mimic an LA sunset. On the second hat, using a brush pen, I wrote out words that referenced Society6's roots and founders. Working just blocks away from the beach in Santa Monica, we at Society6 have seen plenty of amazing sunsets. During the winter, when the sun goes down earlier and everyone is still at work, you can always find people rushing to the outside patios to take pictures of the sunset. This hat is a direct reference to those beautiful Los Angeles evenings that make working in and living in Los Angeles just a bit easier. Scoiety6 wanted one hat that wasn't so masculine. Going with a pastel color palette this hat is meant to be more gender neutral.